DIE Veneris, videlicet, 27 Maii. Jennings and Sir Philip Vernatti. and for a Committee, for Defence of the Kingdom, to meet. Deputy Lieutenants Warrant to nominate Colonels and Captains, &c.
No Records to be removed from Westminster to York. 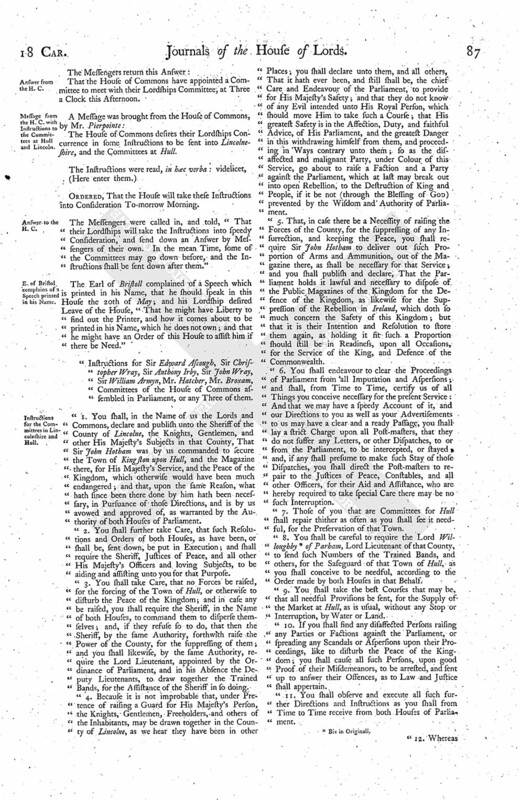 Committee to consider of the Peace of the Kingdom. Message from the H. C. with the following Letters. Mr. Beckwith sent for, as a Delinquent. and for the Magazines of Essex and Norfolk to be under the Deputy Lieutenants. Knight, for Words against the Parliament, to be proceeded against. and for the Committees to meet about the Defence of the Kingdom. Ordinances for raising Men for Ireland. Phillips's Account of several Persons whom be served with Warrants to attend here. The King's Warrant to them, to remain in the Country. Lords gone to York without Leave of the House, under Censure. Lords and other Persons at York to be sent for. Message from the H. C. with Instructions to the Committees at Hull and Lincoln. E. of Bristol complains of a Speech printed in his Name. Instructions for the Committees in Lincolnshire and Hull. Message from the H. C. about the Committee for the Peace of the Kingdom. The House appointed the Lord Wharton to sit as Speaker. Ordered, That the former Order of Mr. Jennings shall be confirmed; and that the Auditors shall make a Certificate to this House of the Matters referred to them; and that a Writ of Ne exeat Regnum shall issue out against Sir Phil. Vernatti. 1. That there (fn. 1) being Information of the Resolution of the King to remove the next Term to Yorke, the House of Commons desires, that some Course may be taken, to prevent the removing of the Records from hence to Yorke. 2. They desire that a Committee may be appointed, to consider of some sit Means for the present Defence of the Kingdom. 3. 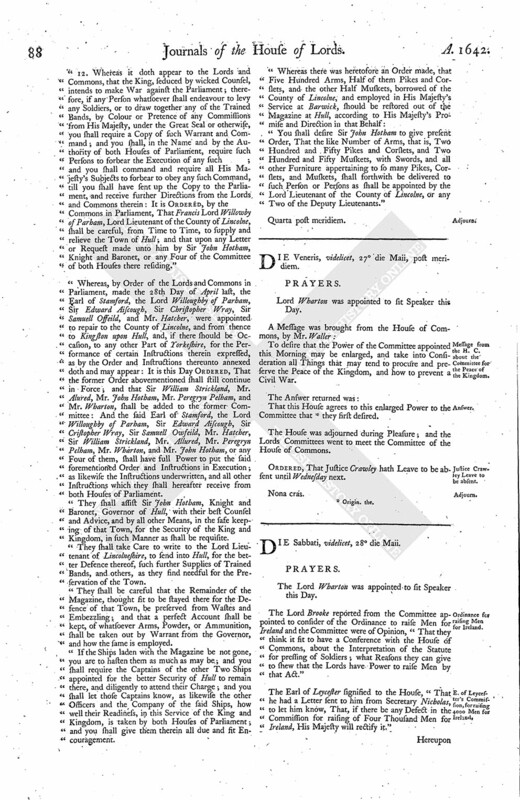 That the House of Commons desires that some Warrant may be granted from the Parliament, to the Deputy Lieutenants of the County of Essex, to nominate Colonels, Captains, and other Officers of the Trained Bands of that County, and to appoint some speedy Day for the Trained Bands of Essex, and Surrey, and Kent, to muster. Ordered, That an Order be sent to all the Keepers of Records, that they shall not remove any Records from Westm. to Yorke. Any Five to meet when and where they please, Three a Clock post meridiem. That they have sent up some Letters, which they have received from Sir Jo. Hotham and others, which they desire (fn. 2) they would read, and send them again, that so they may take some Advice what is fit to be done thereupon; and to let their Lordships know, that they have sent for one Beckwith, at Beverly, a Recusant, as a De linquent, whereby their Lordships may see that the malignant Party are still working Designs to disturb the Peace of the Kingdom. That there was a Design, by Beckwith and others, to surprize the Town of Hull, 25 May, 1642. The Copy of Mr. Beckwith's Letter was read. Mr. Lyndseys, of Hull, his Confession, "That His Majesty had sent to Sheffeld Castle, for Four great Pieces of Ordnance, to be carried to Yorke. Next, Mr. Mayor of Beverley's Letter was read, directed to Sir Jo. Hotham. These Letters were returned presently again. Ordered, That Mr. Beckwith shall be sent for, as a Delinquent. 1. Whereas their Lordships have appointed the Commissions, under the Hand and Seal of the Earl of Warwicke, to be directed to such Colonels and Captains for the Counties of Essex and Northfolke, by the Deputy Lieutenants; the House of Commons desires that the Deputy Lieutenants may have Power to delegate their Power to the Captains, for the choosing of Lieutenants and other inferior Officers, for the Counties of Essex and Norffolke, in the Absence of the Earl of Warwicke;" which was Ordered accordingly, provided it be during the Absence of the Earl of Warwicke, or until he shall give further Direction herein. 2. 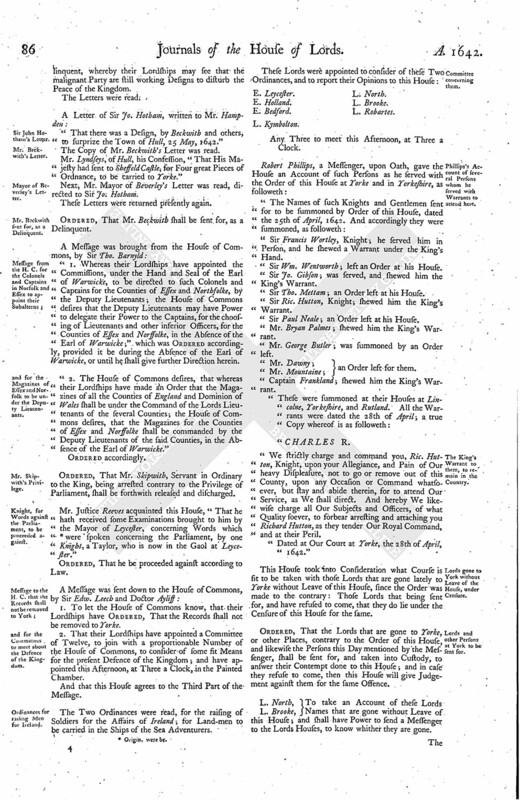 The House of Commons desires, that whereas their Lordships have made an Order that the Magazines of all the Counties of England and Dominion of Wales shall be under the Command of the Lords Lieutenants of the several Counties; the House of Commons desires, that the Magazines for the Counties of Essex and Norffolke shall be commanded by the Deputy Lieutenants of the said Counties, in the Absence of the Earl of Warwicke. Ordered, That Mr. Skipwith, Servant in Ordinary to the King, being arrested contrary to the Privilege of Parliament, shall be forthwith released and discharged. Mr. Justice Reeves acquainted this House, "That he hath received some Examinations brought to him by the Mayor of Leycester, concerning Words which (fn. 3) were spoken concerning the Parliament, by one Knight, a Taylor, who is now in the Gaol at Leycester. Ordered, That he be proceeded against according to Law. 1. To let the House of Commons know, that their Lordships have Ordered, That the Records shall not be removed to Yorke. 2. That their Lordships have appointed a Committee of Twelve, to join with a proportionable Number of the House of Commons, to consider of some fit Means for the present Defence of the Kingdom; and have appointed this Afternoon, at Three a Clock, in the Painted Chamber. And that this House agrees to the Third Part of the Message. The Two Ordinances were read, for the raising of Soldiers for the Affairs of Ireland; for Land-men to be carried in the Ships of the Sea Adventurers. Any Three to meet this Afternoon, at Three a Clock. Sir Francis Wortley, Knight; he served him in Person, and he shewed a Warrant under the King's Hand. Sir Wm. Wentworth; left an Order at his House. Sir Jo. Gibson; was served, and shewed him the King's Warrant. Sir Tho. Mettam; an Order left at his House. Sir Ric. Hutton, Knight; shewed him the King's Warrant. Sir Paul Neale; an Order left at his House. Mr. Bryan Palmes; shewed him the King's Warrant. Mr. George Butler; was summoned by an Order left. Mr. Dawny; an Order left for them. Captain Frankland; shewed him the King's Warrant. We strictly charge and command you, Ric. Hutton, Knight, upon your Allegiance, and Pain of Our heavy Displeasure, not to go or remove out of this County, upon any Occasion or Command whatsoever, but stay and abide therein, for to attend Our Service, as We shall direct. And hereby We likewise charge all Our Subjects and Officers, of what Quality soever, to forbear arresting and attaching you Richard Hutton, as they tender Our Royal Command, and at their Peril. Dated at Our Court at Yorke, the 28th of April, 1642. This House took into Consideration what Course is fit to be taken with those Lords that are gone lately to Yorke without Leave of this House, since the Order was made to the contrary: Those Lords that being sent for, and have refused to come, that they do lie under the Censure of this House for the same. Ordered, That the Lords that are gone to Yorke, or other Places, contrary to the Order of this House, and likewise the Persons this Day mentioned by the Messenger, shall be sent for, and taken into Custody, to answer their Contempt done to this House; and in case they refuse to come, then this House will give Judgement against them for the same Offence. L. North, To take an Account of these Lords Names that are gone without Leave of this House; and shall have Power to send a Messenger to the Lords Houses, to know whither they are gone. That the House of Commons have appointed a Committee to meet with their Lordships Committee, at Three a Clock this Afternoon. The House of Commons desires their Lordships Concurrence in some Instructions to be sent into Lincolneshire, and the Committees at Hull. Ordered, That the House will take these Instructions into Consideration To-morrow Morning. The Messengers were called in, and told, "That their Lordships will take the Instructions into speedy Consideration, and send down an Answer by Messengers of their own. In the mean Time, some of the Committees may go down before, and the Instructions shall be sent down after them. The Earl of Bristoll complained of a Speech which is printed in his Name, that he should speak in this House the 20th of May; and his Lordship desired Leave of the House, "That he might have Liberty to find out the Printer, and how it comes about to be printed in his Name, which he does not own; and that he might have an Order of this House to assist him if there be Need. Instructions for Sir Edward Ascough, Sir Christopher Wray, Sir Anthony Irby, Sir John Wray, Sir William Armyn, Mr. Hatcher, Mr. Broxam, Committees of the House of Commons assembled in Parliament, or any Three of them. 1. You shall, in the Name of us the Lords and Commons, declare and publish unto the Sheriff of the County of Lincolne, the Knights, Gentlemen, and other His Majesty's Subjects in that County, That Sir John Hotham was by us commanded to secure the Town of Kingston upon Hull, and the Magazine there, for His Majesty's Service, and the Peace of the Kingdom, which otherwise would have been much endangered; and that, upon the same Reason, what hath since been there done by him hath been necessary, in Pursuance of those Directions, and is by us avowed and approved of, as warranted by the Authority of both Houses of Parliament. 2. You shall further take Care, that such Resolutions and Orders of both Houses, as have been, or shall be, sent down, be put in Execution; and shall require the Sheriff, Justices of Peace, and all other His Majesty's Officers and loving Subjects, to be aiding and assisting unto you for that Purpose. 3. You shall take Care, that no Forces be raised, for the forcing of the Town of Hull, or otherwise to disturb the Peace of the Kingdom; and in case any be raised, you shall require the Sheriff, in the Name of both Houses, to command them to disperse themselves; and, if they refuse so to do, that then the Sheriff, by the same Authority, forthwith raise the Power of the County, for the suppressing of them; and you shall likewise, by the same Authority, require the Lord Lieutenant, appointed by the Ordinance of Parliament, and in his Absence the Deputy Lieutenants, to draw together the Trained Bands, for the Assistance of the Sheriff in so doing. 4. Because it is not improbable that, under Pretence of raising a Guard for His Majesty's Person, the Knights, Gentlemen, Freeholders, and others of the Inhabitants, may be drawn together in the County of Lincolne, as we hear they have been in other Places; you shall declare unto them, and all others, That it hath ever been, and still shall be, the chief Care and Endeavour of the Parliament, to provide for His Majesty's Safety; and that they do not know of any Evil intended unto His Royal Person, which should move Him to take such a Course; that His greatest Safety is in the Affection, Duty, and faithful Advice, of His Parliament, and the greatest Danger in this withdrawing himself from them, and proceeding in Ways contrary unto them; so as the disaffected and malignant Party, under Colour of this Service, go about to raise a Faction and a Party against the Parliament, which at last may break out into open Rebellion, to the Destruction of King and People, if it be not (through the Blessing of God) prevented by the Wisdom and Authority of Parliament. 5. That, in case there be a Necessity of raising the Forces of the County, for the suppressing of any Insurrection, and keeping the Peace, you shall require Sir John Hotham to deliver out such Proportion of Arms and Ammunition, out of the Magazine there, as shall be necessary for that Service; and you shall publish and declare, That the Parliament holds it lawful and necessary to dispose of the Public Magazines of the Kingdom for the Defence of the Kingdom, as likewise for the Suppression of the Rebellion in Ireland, which doth so much concern the Safety of this Kingdom; but that it is their Intention and Resolution to store them again, as holding it fit such a Proportion should still be in Readiness, upon all Occasions, for the Service of the King, and Defence of the Commonwealth. 6. You shall endeavour to clear the Proceedings of Parliament from all Imputation and Aspersions; and shall, from Time to Time, certify us of all Things you conceive necessary for the present Service: And that we may have a speedy Account of it, and our Directions to you as well as your Advertisements to us may have a clear and a ready Passage, you shall lay a strict Charge upon all Post-masters, that they do not suffer any Letters, or other Dispatches, to or from the Parliament, to be intercepted, or stayed and, if any shall presume to make such Stay of those Dispatches, you shall direct the Post-masters to repair to the Justices of Peace, Constables, and all other Officers, for their Aid and Assistance, who are hereby required to take special Care there may be no such Interruption. 7. Those of you that are Committees for Hull shall repair thither as often as you shall see it needful, for the Preservation of that Town. 8. You shall be careful to require the Lord Willoughby (fn. 4) of Parham, Lord Lieutenant of that County, to send such Numbers of the Trained Bands, and others, for the Safeguard of that Town of Hull, as you shall conceive to be needful, according to the Order made by both Houses in that Behalf. 9. You shall take the best Courses that may be, that all needful Provisions be sent, for the Supply of the Market at Hull, as is usual, without any Stop or Interruption, by Water or Land. 10. If you shall find any disaffected Persons raising any Parties or Factions against the Parliament, or spreading any Scandals or Aspersions upon their Proceedings, like to disturb the Peace of the Kingdom; you shall cause all such Persons, upon good Proof of their Misdemeanors, to be arrested, and sent up to answer their Offences, as to Law and Justice shall appertain. 11. You shall observe and execute all such further Directions and Instructions as you shall from Time to Time receive from both Houses of Parliament. 12. 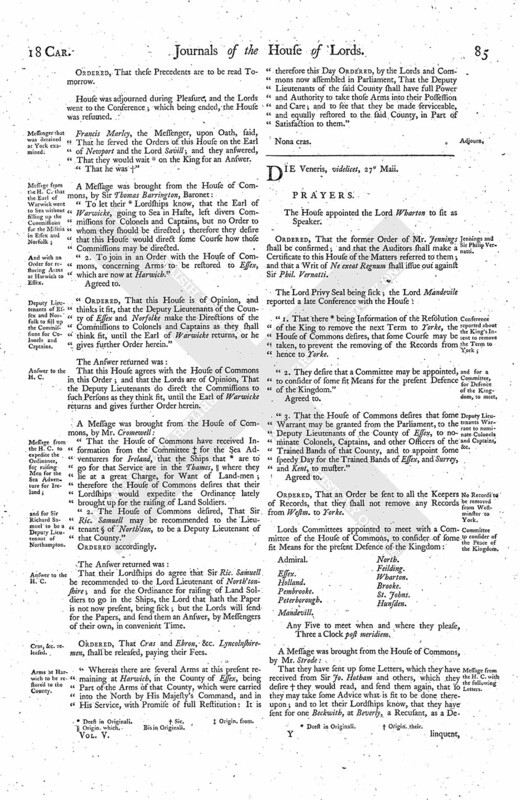 Whereas it doth appear to the Lords and Commons, that the King, seduced by wicked Counsel, intends to make War against the Parliament; therefore, if any Person whatsoever shall endeavour to levy any Soldiers, or to draw together any of the Trained Bands, by Colour or Pretence of any Commissions from His Majesty, under the Great Seal or otherwise, you shall require a Copy of such Warrant and Command; and you shall, in the Name and by the Authority of both Houses of Parliament, require such Persons to forbear the Execution of any such; and you shall command and require all His Majesty's Subjects to forbear to obey any such Command, till you shall have sent up the Copy to the Parliament, and receive further Directions from the Lords and Commons therein: It is Ordered, by the Commons in Parliament, That Francis Lord Willowby of Parham, Lord Lieutenant of the County of Lincolne, shall be careful, from Time to Time, to supply and relieve the Town of Hull; and that upon any Letter or Request made unto him by Sir John Hotham, Knight and Baronet, or any Four of the Committee of both Houses there residing. Whereas, by Order of the Lords and Commons in Parliament, made the 28th Day of April last, the Earl of Stamford, the Lord Willoughby of Parham, Sir Edward Aiscough, Sir Christopher Wray, Sir Samuell Offeild, and Mr. Hatcher, were appointed to repair to the County of Lincolne, and from thence to Kingston upon Hull, and, if there should be Occasion, to any other Part of Yorkeshire, for the Performance of certain Instructions therein expressed, as by the Order and Instructions thereunto annexed doth and may appear: It is this Day Ordered, That the former Order abovementioned shall still continue in Force; and that Sir William Strickland, Mr. Alured, Mr. John Hotham, Mr. Peregryn Pelham, and Mr. Wharton, shall be added to the former Committee: And the said Earl of Stamford, the Lord Willoughby of Parham, Sir Edward Aiscough, Sir Cristopher Wray, Sir Samuell Owfeild, Mr. Hatcher, Sir William Strickland, Mr. Allured, Mr. Peregryn Pelham, Mr. Wharton, and Mr. John Hotham, or any Four of them, shall have full Power to put the said forementioned Order and Instructions in Execution; as likewise the Instructions underwritten, and all other Instructions which they shall hereafter receive from both Houses of Parliament. They shall assist Sir John Hotham, Knight and Baronet, Governor of Hull, with their best Counsel and Advice, and by all other Means, in the safe keeping of that Town, for the Security of the King and Kingdom, in such Manner as shall be requisite. They shall take Care to write to the Lord Lieutenant of Lincolneshire, to send into Hull, for the better Defence thereof, such further Supplies of Trained Bands, and others, as they find needful for the Preservation of the Town. They shall be careful that the Remainder of the Magazine, thought fit to be stayed there for the Defence of that Town, be preserved from Wastes and Embezzling; and that a perfect Account shall be kept, of whatsoever Arms, Powder, or Ammunition, shall be taken out by Warrant from the Governor, and how the same is employed. If the Ships laden with the Magazine be not gone, you are to hasten them as much as may be; and you shall require the Captains of the other Two Ships appointed for the better Security of Hull to remain there, and diligently to attend their Charge; and you shall let those Captains know, as likewise the other Officers and the Company of the said Ships, how well their Readiness, in this Service of the King and Kingdom, is taken by both Houses of Parliament; and you shall give them therein all due and fit Encouragement. You shall desire Sir John Hotham to give present Order, That the like Number of Arms, that is, Two Hundred and Fifty Pikes and Corslets, and Two Hundred and Fifty Muskets, with Swords, and all other Furniture appertaining to so many Pikes, Corslets, and Muskets, shall forthwith be delivered to such Person or Persons as shall be appointed by the Lord Lieutenant of the County of Lincolne, or any Two of the Deputy Lieutenants. Lord Wharton was appointed to sit Speaker this Day. To desire that the Power of the Committee appointed this Morning may be enlarged, and take into Consideration all Things that may tend to procure and preserve the Peace of the Kingdom, and how to prevent a Civil War. That this House agrees to this enlarged Power to the Committee that (fn. 5) they first desired. The House was adjourned during Pleasure; and the Lords Committees went to meet the Committee of the House of Commons. Ordered, That Justice Crawley hath Leave to be absent until Wednesday next.